Almost certainly an Army team playing a Services match, circa 1943-45 - quite possibly against the RAAF team seen in Photo 8. (Note all players here wear black shorts; the players in Photo 8 are wearing white). Photographed at Punt Road Oval (Richmond) with the grandstand half-full. 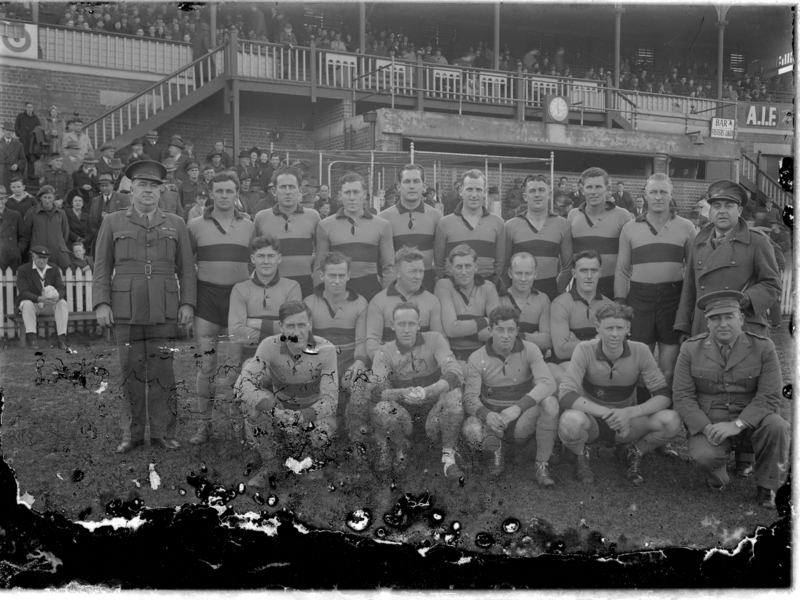 Players identified are: Reg ‘Dodger’ Ryan (North Melbourne, third player from left in back row), Jack Mueller (Melbourne, fourth player from left in back row), Bert Clay (Fitzroy, fifth player from left in back row), Bert Mills (Hawthorn, extreme right of back row), Phonse Kyne (Collingwood, extreme right of middle row), Ted Leehane (Essendon, extreme right of front row). Three uniformed Army officers are in the group. Army uniforms (and slouch hats) in crowd. Emulsion damage along bottom of the photo partly obscures one player in front row. Guernsey design not recognisable - probably light blue with red hoop. 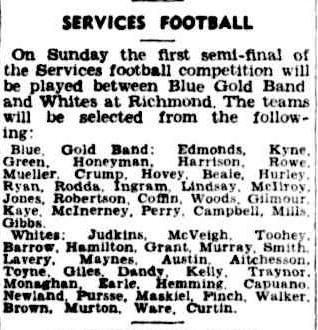 Team is probably the Mt Martha Area 'Blue and Gold Band' Team in the 1942 Inter-Services Competition. Possibly at the 1st Semi Final at Richmond 26 July 1942 against the Watsonia 'Whites'. Other player that are possibly in the photo are Alf Hurley and Norm Campbell. Campbell and Hurley are mentioned as prominent players in the team and are therefore likely to be VFL players of the time. Although I cannot find a reference to Mathieson playing for Blue and gold Band, the player front row far left resembles Jack Mathieson of Hawthorn.